I’ve written about two different mobile phone projects on the blog, Fairphone and Phonebloks. The first is an attempt to make an ethically sourced and manufactured handset. The second is a concept for a modular phone that can be upgraded or customised by switching in parts. They’re both good ideas, so I was interested to find out that the concepts have recently overlapped – the new Fairphone is modular. Modularity is a key aspect of circular economy design. It means that if a part breaks or malfunctions, it can easily be replaced. You could order the part and fit it yourself. It also means you could upgrade the phone without needing a whole new handset. The life of the handset is extended, which means fewer handsets thrown away or abandoned in drawers, waiting to be recycled. Most phones are not made this way. Think about the last thing that broke on a phone – perhaps you cracked the glass. That should be easily replaced, but on many phones the glass is fused into the case. The whole phone, with its perfectly functioning and expensive internals, will have to be replaced – or you can keep using a phone with a broken screen. Or perhaps you’re happy with your phone, but you’re getting poor battery performance. Most phones can be opened up to replace the battery, but not all of them. Some of them are glued in. This serves the phone companies very well, because they’d prefer that we bought new phones rather than replacing them. Some actively discourage customers from trying to repair their devices by using invisible clips or requiring proprietary tools to open them. Very few companies publish repair manuals or release technical specifications, meaning most repair guides are compiled by activist engineers on forums such as iFixit. In their second edition handset, Fairphone have learned a few new tricks and taken a modular approach. Key components can be easily removed and replaced, with the deliberate aim of creating a phone that customers will be able to fix themselves with no technical expertise. It’s a first in the mobile phone industry, and unsurprisingly it’s come from a socially-minded company that can do things that corporations won’t. But it it succeeds, and there’s demand for longer-lasting handsets, then it won’t be the last phone built on this basis. We’re slaves enough to our phones — may as well not have to get them replaced all the time! This is an exciting development from what I can see. Very interested in this article and hope Fairphone succeed! 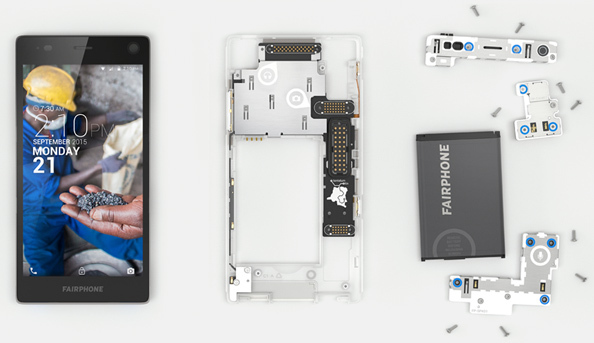 The modular design and spare parts make it easy for anyone to repair the FAIRPHONE. Please keep us up to date like this. Thanks for sharing.